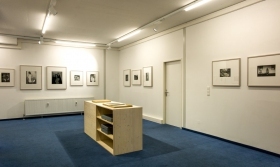 Inaugurated in April 2015 the FOTOHOF archive is comprised, first and foremost, of photographs by Austrian and selected international artists. The collection also includes negatives, digital data, documents, and all materials illustrating each particular artist’s development. 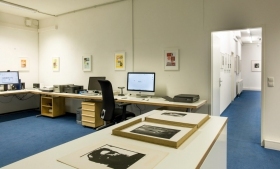 The archive itself and the facility it provides to search for photographs and archive material are structured in each case around the artist’s name. 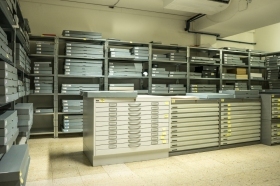 Besides its actual safekeeping mandate the Fotohof archiv also sees itself as a research, study and competence centre. A small exhibition space has been set aside for exhibitions and presentations (ARCHIVE PRESENTATIONS) focusing on the topic areas under study. 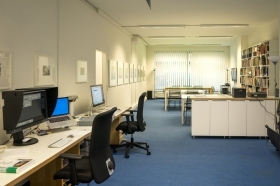 A study and training room is available for processing, digitising and printing photographs, also providing premises for small-scale courses and a work environment for curators. 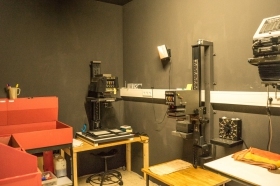 An analogue darkroom and book storeroom are also provided. The menu item ARCHIVE PRINTS provides an overview of the FOTOHOF archive inventory. It opens an initial random selection, which you can then scroll down. Each photograph comprises another collection. Moving the mouse pointer over one of these preview images displays a nutshell of information on the collection contents; clicking opens the collection, featuring further examples of photographs. To view the photographs of a particular artist, click the search box to obtain a list of the artists in the archive. To make use of the archive, please contact us through FOTOHOF. Appointments to view the archive can be arranged on an individual basis.